Most investors have heard the comment that gold is a bad investment because it doesn’t pay a dividend. Unlike shares or a rental property, some say, gold doesn’t provide a cash flow – and apparently doesn’t have any “real” value. This simplistic analysis ignores how gold behaves when markets move around rapidly, and therefore the value of gold in a portfolio. Because of its scarcity value, gold tends to hold up better than most other investments when markets fall. That’s why central banks around the world have been buying gold for the last few years – as a buffer against future economic instability. 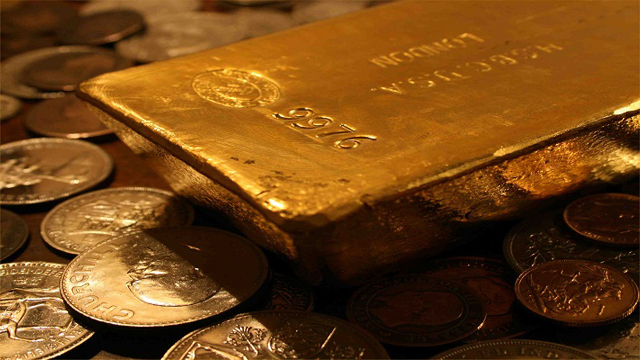 Gold can be an important part of most investors’ portfolios. Gold works especially well when inflation kicks in – when the value of other assets is being eroded by inflation, the scarcity value of gold helps it hold its worth. Inflation works like this: if you buy a share today for $1 and if inflation runs at 10% for the next year, the share price will have to grow to $1.10 just to keep its original value. Of course, when you buy shares you hope they grow in value. Inflation means that some of that growth is needed just to maintain the share’s original value. To catch a bus in Sydney over 1-2 sections in 1996 cost $1.20. In 2013 that same bus ride will now cost you $2.20, or a rise of 83%, showing the effect inflation has on prices over time. If we take this example further, the average price of gold during 1996 was US$388 per ounce. 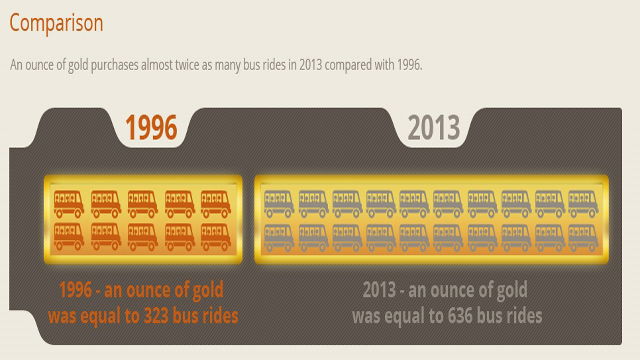 One ounce of gold would be equivalent to around 323 bus rides. In 2013, at the time of writing an ounce of gold is approximately US$1,400 and would be equivalent to around 636 bus rides – generating excess returns above inflation alone. Gold has outperformed all other assets during previous periods of high inflation. The gold price has tended to rise in line with inflation – and data from Oxford Economics suggests that gold is a better hedge against inflation than major asset classes like shares, bonds, cash…and even houses (Source: Oxford Economics: “The impact of inflation and deflation on the price of gold”, 2010). Gold also tends to be a good hedge against deflation – the opposite of inflation. Deflation is when asset prices fall, because of an economic slowdown. Deflation was seen in the Great Depression – loud and clear! One of the ongoing worries about the global economy is that even as growth is declining, the US may potentially unwind its economic stimulus package. 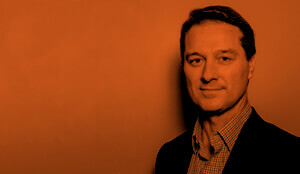 This decline in growth is flowing through to Australia, as the mining boom slows down. Australian inflation is now below the “sweet spot” that the RBA monitors – and without care, deflation may come to Australia. Data from Oxford Economics suggests that gold may be a better hedge against deflation than shares and house prices. The Oxford Economics findings are summarized below. 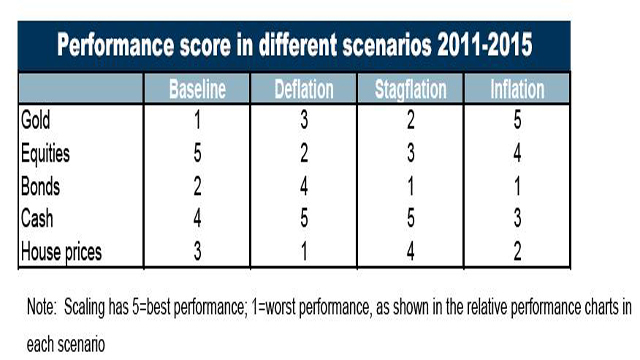 The below table shows the expected relative performance of different asset classes modeled under different market scenarios . The baseline scenario is a relatively benign economic environment (a steady economic recovery, with moderate inflation and a slow normalization of financial conditions). Source: Oxford Economics: “The impact of inflation and deflation on the price of gold” (2010). Note that future outcomes are not guaranteed. So gold can be an important part of your portfolio, especially when markets and investments are volatile – and especially when inflation or deflation kicks in. BetaShares Gold Bullion ETF – Currency Hedged (ASX: QAU) provides exposure to the price of gold bullion and is backed by physical gold bullion. The ETF hedges substantially all of its US dollar exposure back to the Australian dollar – providing for a ‘purer’ exposure to the gold price. 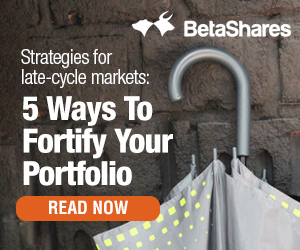 For more information see BetaShares website. What’s really driving US stock prices?